Super Fine Mesh for Complete Juice Extraction. 3 speed with incher for momentary operation. Overload protector for motor safety. Spatula for easy removal of Mix and change of Blades. Shock Proof Engineered Plastic Body. Removable liquidizing jar base for convenient Cleaning. Elegant body design with superior aesthetics. Function: Dry & Wet Grinding, Blending, Grating, Mincing. 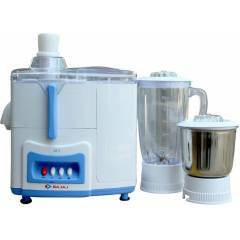 Bajaj 450W Majesty JX7 White & Blue Juicer Mixer Grinder is a premium quality Juicer Mixer Grinders from Bajaj. Moglix is a well-known ecommerce platform for qualitative range of Juicer Mixer Grinders. All Bajaj 450W Majesty JX7 White & Blue Juicer Mixer Grinder are manufactured by using quality assured material and advanced techniques, which make them up to the standard in this highly challenging field. The materials utilized to manufacture Bajaj 450W Majesty JX7 White & Blue Juicer Mixer Grinder, are sourced from the most reliable and official Juicer Mixer Grinders vendors, chosen after performing detailed market surveys. Thus, Bajaj products are widely acknowledged in the market for their high quality. We are dedicatedly involved in providing an excellent quality array of Bajaj Juicer Mixer Grinders.